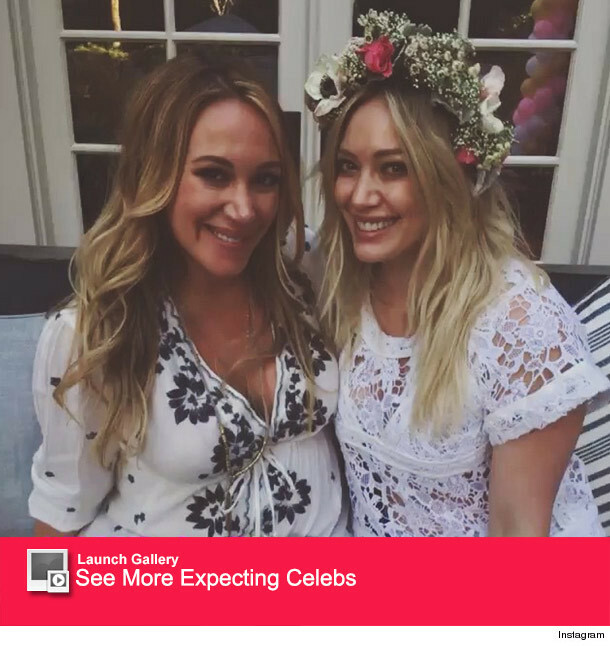 Hilary Duff Throws Pregant Sister Haylie a Star-Studded Baby Shower! Hilary Duff sure knows how to throw a party! The actress celebrated older sister Haylie's baby shower on Saturday and the affair was filled with sweet treats, lots of flowers and a ton of celebrity guests. The "Younger" star and her mother Susan Colleen Duff planned the bash at Hilary's home for the "Real Girl's Kitchen" host, who is expecting a baby girl with fiance Matt Rosenburg. Among the celeb guests who came out to support Haylie's first baby were Lauren Conrad, Jenna Dewan Tatum, Ali Fedotowsky, Kaley Cuoco, Beverly Mitchell, Lacey Chabert and Joanna Garcia. The soon-to-be-aunt posted a flipagram slideshow of the shower, which gives us all an inside look at the adorable event. "Sissy @haylieduff you are the most beautiful sister/mom to be and I love you so much! Happy baby shower day! Thank you to so many for coming and a big thanks to @donatiennela @hannahskvarla @ashleybeverly @thecrowncollective @lowenban @realjoseph #mhbabylove," Hilary captioned the Instagram post. In the slideshow, the attendees are all seen wearing flower crowns from The Bouqs and snacked on colorful treats and ice cream from Steve's Ice Cream. In another shot, Hilary was snapped enjoying a push on the swing from her adorable 2-year-old son Luca. "Who's the baby?? #mhbabylove," she said of the sweet snap. What do you think of Haylie's special day?! Tell toofab in the comments section below then click "Launch Gallery for more expecting celebs! Haylie Duff Shows Off Big Baby Bump -- See the Cute Pic!